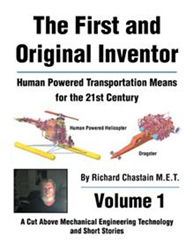 Richard Chastain has released a new book where he gives an in-depth discussion on human-powered transportation. “The First and Original Inventor: Human Powered Transportation Means for the 21st Century” (published by AuthorHouse) provides solid groundwork for anyone who wants to learn how to build aircrafts, vehicles, vessels and spacecrafts. “The First and Original Inventor” is a culmination of everything the author experienced that is relevant to the analytical development of human-powered transportation means. Digesting the information in these publications will make it so that anyone can design and develop their own 21st-century human-powered means of transportation and be weaned off the umbilical cords of combustible petroleum by-products. The necessity for locomotion, heat, flight, present-day speeds, and anything which is developed by the internal combustion engine is conquered by these means of applying force and motion into society as we know it today. Practical and incisive, “The First and Original Inventor” is a handy reference for both experts and beginners in the field of transportation technology. Richard Chastain has two associate degrees and five correspondence school diplomas. He is the author of “Random Generator.” He has ridden his bicycle from Louisville to Florida twice, equipped for camping in four seasons and hunting with a crossbow. Unknowingly at first, his entire lifespan is dedicated to developing means for this century’s human-powered transportation means.